A textual read of the elements of the first three Metal Gear Solid games reveal an analysis of the creation of both the individual and the societies they form with others. So complete was the deconstruction that they exist thematically separate from the entries that followed, in essence comprising their own complete trilogy. But there was a problem: there was still much story to be told. With the close of this first ‘identity’ trilogy, Hideo Kojima embarked on a second, expanding on the epistemological convergence between the individual and the society as he’d already explored them- politics. 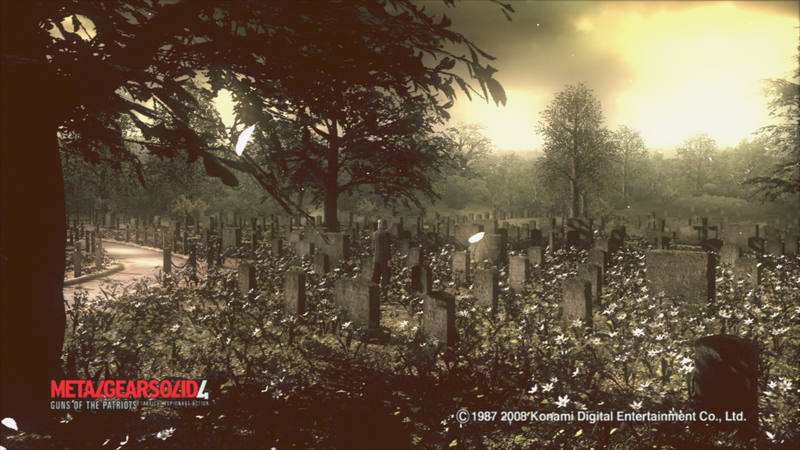 Starting with MGS4, the series worked towards completing its narrative loop while examining the rise of a new type of political strategy that came into vogue in the modern era with the development of a workable model of proxy warfare. Though there are recurring themes throughout these three works, most notably the ideas of transformation and rebirth, the concept of political proxies is the thread that ties them together, first portraying its characteristics and then showing its range of applications. As the series starts with the end of Solid Snake’s story arc, the lynchpin to this analysis is the recognition of history in the many forms it takes. Guns of the Patriots, Peace Walker, and The Phantom Pain are all examples of Metal Gear Solid acknowledging history; of the lives of its characters, of itself as a series, and of the real world in which it exists. Solid Snake narrates the state of the world that opens Metal Gear Solid 4, his weary, grizzled voice telling us how war has changed as a shipment of rebels arrives in a PMC controlled part of the Middle East. The battlefield has evolved into a system in which all action is monitored, analyzed, and controlled, where the human element of combat has been reduced to the point where it’s facilitated an amoral war machine endlessly consuming life. As a hooded Solid Snake jumps off the truck, we see a wrinkled face and grey hair. Snake has been many things, had many faces, but now he’s Old. In typical Kojima style, the metaphor stands on half a dozen levels, but it’s an important close for the theme of the series thus far. Because the Les Enfants Terribles project collected DNA from a middle aged Big Boss, the clones are afflicted with advanced aging, with a remaining life expectancy of a year. We also discover a new cinematic device that is as simple as deep, flashing still shots from the previous games to contextualize the unfolding situation. In addition to acting as contextual references, these ‘memories’ add characterization for Snake, an old man remembering his life when confronted with the imminence of his death. But if you realize that these events made him the man he is today, cultivating in him a sense of intuition based on his experience and instinctual nature, then they helped make him into a great soldier. For the fight ahead, he’s going to need to be. The war economy was the product of the conflict between weapons control system SOP and the advent of Private Military Companies. In MGS2, soldier’s weapons were fitted with ID tags that would only operate for the right owner and SOP turned it into a ubiquitous military system, a societal alternative to the Cold War’s strategy of mutual deterrence. At the same time, PMC’s, elite rentable armies that can be mobilized globally free of government and ideology, have become so common that the biggest rivals even the United States military. This multinational corporation, resurrecting the Outer Heaven brand, is run by the four members of the Beauty and the Beast Unit, executives under their CEO Liquid Ocelot, the body of Revolver Ocelot completely overrun by the Liquid Snake persona. Through its gameplay, MGS2 explored how mechanisms in the social structure can shape behaviors of the population. By shifting and constricting the range of beliefs and thoughts an individual was allowed to have, the politics of the group would be molded. In a similar fashion, MGS4 uses the combination of the ID system with the PMC’s to create a self-enslaving war machine, as the only defense against the violent system was to voluntarily enter it. When Snake finally tracks down Liquid, it’s in time to witness his first offensive against SOP. The result is chaos, with every soldier unleashing unrestrained emotion, laughing, raging, crying, and screaming. Soldier’s nanomachines had been numbing them to the reality of their violence, making them better warriors through apathy. As is often the reaction to regulation, a black market emerged allowing repurposed weapons to have their tags laundered. The first time we see the four members of the B&B, they have slaughtered a squadron of rebels, leaving in their wake a corridor of bodies and their guns shining like gold. There’s an undeniably dark cynicism in this scene and how the war economy values weapons more than human life but it shows how heroes have little choice but to become outlaw scavengers in order to fight back. When Snake makes contact with resistance forces under Big Mama, he finally meets Eva, who had been the surrogate mother for the Les Enfants Terribles project. She tells Snake how after The Boss died, Major Zero obtained the rest of the Philosophers Legacy, and with Big Boss, Ocelot, Sigint and Paramedic, formed the Patriots to make her ideals of a united world free of borders a reality. When the organization collapsed in disagreement on the interpretation of those ideals, Big Boss and Zero went to war, each believing they had the answer. One decided to build a nation that would provoke endless conflict, while the other chose to implement invisible controls in the fabric of society to guide actions and beliefs. The theme of transformation has been present since Old Snake’s reveal, but is explored with almost every character. Look at The Beauty and the Beast Unit; Laughing Octopus, Raging Raven, Crying Wolf, and Screaming Mantis, women ruled by the very emotions SOP was meant to curtail, each turned into animals by a horrific past, their mechanical exoskeletons juxtaposing the young, beautiful figures inside. A different but equally significant change happened with Raiden, utilizing the same technology to become the most advanced Cyborg Ninja yet, his organic parts replaced by implants and chrome. This is what the war economy does- it strips people of their humanity and turns them into monsters. The balance maintained between the two forces completely topples at the mid act two flip. In the background of the first half is a progression that covers a complete military takeover of invasion, subjugation, and occupation, instilling the fear that every nation is being conquered systematically. The concern turns real when Liquid finally hijacks SOP, locking down every modern gun save his own which he aims at the defenseless United Nations forces that have rallied to oppose him. The turn of events exposes the very real danger of centralizing power and puts the freedom of the entire world at stake. A second progression had begun to form in act three but was initiated before. There were many familiar characteristics about Laughing Octopus beside just sharing the codename with the FOX-HOUND agent- her tentacles and gun are similar to Solidus armaments and her elated laughter during combat are reminiscent of The Joy. The sense of déjà vu is reinforced in the 60’s era spy aesthetic of the third act and the motorcycle chase with Eva that harkens back to the Shagohod fight in Snake Eater. While it gives the strong appearance of going through a greatest hits remix of the series events, it’s more importantly about Snake reliving his past. Memories are the representation of a person’s history. The return to Shadow Moses to claim Rex’s pre-ID tagged railgun opens with a perfectly emulated version of the helipad from the Playstation’s original Metal Gear Solid in all its 32-bit glory. When Snake wakes from his dream, he’s being air dropped at the outskirts of the Alaskan military base rendered in hi-def on the PS3 hardware. Over the course of the decade between the two games, everything has changed. More than simply being commentary on the reliability of memories, it’s a sharp lesson on technological obsolescence and the march of time. But the steel beams of Shadow Moses have rusted over; it’s once state of the art systems woefully out of date. As MGS explored the concept of genetic manipulation, it was implicitly aided by the Playstation’s tech and the polygons that allowed for greater versatility than the 2D sprites it had relied on thus far. MGS4 contrasts the hardware powering these games to show how Solid Snake, and arguably the place that made him famous, are now cultural relics. By running Snake through his memories, the game is reminding you of the path that led you here and telling you it’s impossible to turn back. So far, each entry in the series has used its enemy squad as an element of the theme that must be defeated before Snake can tackle the final leader and complete his mission, and the design continues here, albeit in a different way. 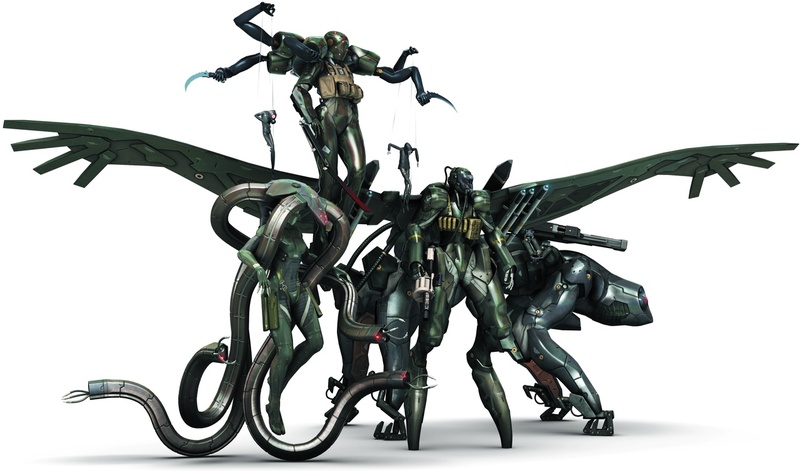 Every member of the B&B is a combination of the enemies from each of the previous games, creating an amalgamation of the threats ingrained in Snake’s memory. In a real sense, he is fighting his past. Snake is fighting a war of proxy agents indirectly exerting their will over the population by strangling individual liberty. In loose terms, a proxy is an agent that stands in and acts on another’s behalf, an example being a soldier fighting on behalf of a government. On a societal level, the Patriot A.I.s are proxies for Major Zero’s social structures as Liquid’s PMC’s are trying to realize Big Boss’ dream of a world united by battle. On an individual level, a person is a proxy for the components of biology, culture, and experience that shaped them. By unshackling himself from his past, Snake is becoming free to oppose a social system that wants to control everyone. With the executive level of Liquid’s corporation dismantled, Snake enters the final battle staged atop Outer Haven, the massive cruiser that contains the A.I. net that the old Russian had seized. Having infected the system with the anti-virus Fox-Alive, Solid Snake turned to his old nemesis and the final showdown their lives had culminated in. Punch for punch, the two old men waged their personal war. The one that would walk away triumphant was the one that had the will to change, to let go. Just as genes perish, memes are forgotten, and The Times change, bodies die, culture is displaced, and the river of history flows on. By looking back on his life, Solid Snake was not only able to find peace, but closure. And yet, as he still lives, so will his genes. Standing among the graves of fallen patriots, he reunites at last with Big Boss, a senile Zero in tow. And after taking Zero, Death came to collect Solid Snake, but was fooled when Big Boss stepped forward in his place, becoming his sons proxy in death to eradicate his destructive lineage, atoning for own his sins in the process. 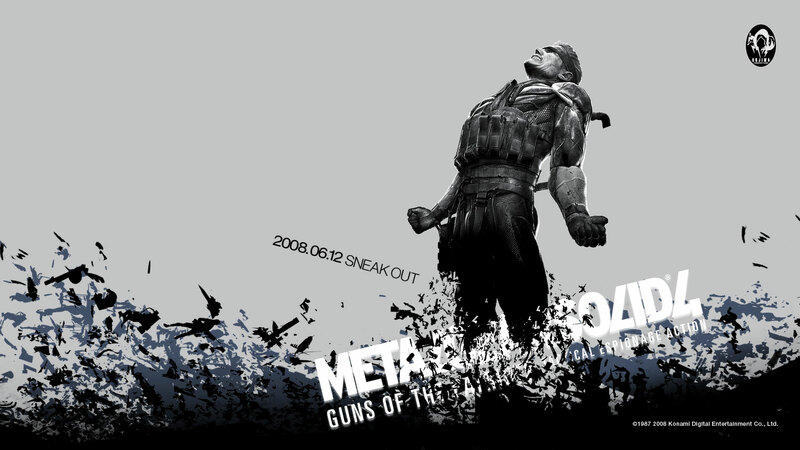 As the closing of the Solid Snake arc, Guns of the Patriots is about taking hold of the freedoms that allow you to be the person you want to be. And so, the hero Solid Snake sheds his codename so that the man named David can create new memories free of battle, with the time he has left.